Help Tara, Maya, and Rahul are journey across the dark hills of Cherai to find The Regal Scepter before is is overtaken by a powerful, evil magician. 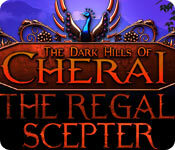 In The Dark Hills of Cherai: The Regal Scepter, players search for the ancient artifact locked away behind a door that can only be opened by combining 12 amulets. But that's not all! The Regal Scepter is also protected a guardian creature, who Tara, Maya, and Rahul must cleverly circumvent before saving Cherai's powerful piece of regalia.